It's been six years or so since I was officially part of the gainfully employed masses. Besides a consulting gig here and there, I've been a stay-at-home mom since before my four-year-old was born, and while it's definitely had its good days and bad days, I'm glad to have the opportunity to spend so much time with my children while they are young, and to volunteer at their schools and with other organizations I support. So this book, at first glance, wouldn't seem to have much to offer me. But as I read I identified with a great deal of what Ms. Sandberg wrote. First of all, Ms. Sandberg, current COO of Facebook, was clear that she was writing from her experience, and that her path, her suggestions, were not the only viable choices for women to make. She lauds those who choose to stay home when they are able: "No one should pass judgment on these highly personal decisions. I fully support any man or woman who dedicates his or her life to raising the next generation. It is important and demanding and joyful work." However, she was also clear that she believes - with Nobel Peace Prize winner Leymah Gbowee (read my review of her amazing memoir here) - that "conditions for all women will improve when there are more women in leadership roles giving strong and powerful voice to their needs and concerns." The economic realities of today mean that most women will need to work to support their family at some point. Ms. Sandberg shares data from a 2009 study which shows that 41% of mothers are primary breadwinners who earn the majority of their family's income. Another 23% of mothers earn at least a quarter of the family's income. That's almost two-thirds of women with children at home, earning a sizable chunk of what their family lives on. And in 2006, one in five families was headed by a single mother. There are plenty of reasons to lament these trends and statistics, to bemoan the breakdown of the nuclear family, the lack of fathers in the home, and so on. But expending energy lamenting them doesn't solve the problem, and it doesn't help those families or those mothers deal with their daily reality. These women and their families need more supportive work environments and more guidance on how to negotiate the tricky balance between professional success and personal fulfillment. This is where Lean In helps. Over and over again, I recognized my previous working-world self in the self-defeating actions Ms. Sandberg describes. The "imposter syndrome", or feeling like a fraud, sure that I wasn't worthy of recognition or my accomplishments. Not "keeping my hand up" and pushing for my questions to be answered. Being too concerned about pleasing everyone, not recognizing that it's impossible to make progress without change, and it's impossible to make changes that everyone agrees with. Waiting and hoping for a mentor to find me, rather than developing those relationships intentionally myself. Being afraid to ask for what I needed or wanted in a position, and then never getting it. Making choices based on my guesses of what my future might hold, rather than what would be best for my career in the moment, and consequently limiting and hamstringing myself. I wish I'd had this book ten years ago; I might have made some significantly different decisions that would have provided better opportunities for my future self. "Fear is at the root of so many of the barriers that women face. Fear of not being liked. Fear of making the wrong choice. Fear of drawing negative attention. Fear of overreaching. Fear of being judged. Fear of failure. And the holy trinity of fear: the fear of being a bad mother/wife/daughter." And this isn't just about pushing women ahead to the detriment of men; it's about a more equal partnership all around. Ms. Sandberg states, "As women must be more empowered at work, men must be more empowered at home." I have known several wonderful, nurturing, committed stay-at-home dads who experienced many of the same struggles as stay-at-home moms, but felt very isolated without the support networks many moms have. In addition to encouraging women to "lean in" to their careers, she encourages men to "lean in to their families," and points out that current employment policies often encourage the opposite through minimal paternity leave and inflexible hours. "Even if mothers are more naturally inclined toward nurturing, fathers can match that skill with knowledge and effort...We overcome biology with consciousness in other areas...A willing mother and a willing father are all it requires." Lean In is filled with good actionable advice, but it's necessarily vague. While she provides many examples and anecdotes from her own career, Ms. Sandberg isn't in your position and can't tell you that Ms. Johnson on the 6th floor would make a great mentor and sponsor, to speak up in the staff meeting on Wednesday morning, or to volunteer to develop the next sales presentation. Getting the most out of Lean In will require the reader to make an honest assessment of where she is in her career, where she wants to be, her strengths, her weaknesses, and much more. Blanket statements like "if [you] hear a bad idea...[you] should either fight it or ignore it" should be taken with an eye toward the environment at your workplace. "Perfection is the enemy" is a true maxim, but only you can decide in which aspects of your life to accept 95% or even 50% in order to give other parts 100%. Ms. Sandberg's definition of success mirrors this personalization: "success is making the best choices we can...and accepting them." One of the greatest outcomes from Ms. Sandberg giving her TED talk and publishing this book is that it increases the profile of this important conversation. As she says, "talking can transform minds, which can transform behaviors, which can transform institutions." More than that, it's just about the only way that transformation can happen. Of course, not everyone agrees on the best approach to every issue, even within the feminist movement, but Ms. Sandberg asks that we "strive to resolve our differences quickly, and when we disagree, stay focused on our shared goals. This is not a plea for less debate, but for more constructive debate." We are all individuals, making the best choices we can for our own personal situations. "One of the conflicts inherent in having choice is that we all make different ones. There is always an opportunity cost, and I don't know any woman who feels comfortable with all her decisions. As a result, we inadvertently hold that discomfort against those who remind us of the path not taken. Guilt and insecurity make us second-guess ourselves and, in turn, resent one another." We need to be aware of this tendency, and truly accept that others are making the best choices for themselves, and that those choices may legitimately be different from ours. One criticism I've heard from men and women who don't sympathize with feminists is that we're a bunch of whiners. After all, we aren't working 18-hour days for pennies in workhouses and sweatshops like people did a hundred or so years ago. We aren't being gang raped like women today in the Congo, or even restricted from traveling without a male family member like women in Saudi Arabia. I mean, we can drive and own property and even vote! We have it so good now compared to every other group of women who's ever lived, so we have no right to complain about our perceived problems. Ms. Sandberg's response is perfect: "Knowing that things could be worse should not stop us from trying to make them better." So let's all do what we can to make them better for everyone. 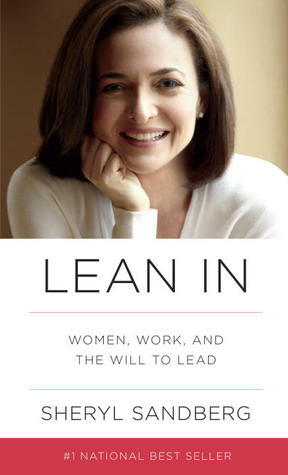 Sheryl Sandberg's Lean In is a good start. Here's the TED talk on this topic by Ms. Sandberg.